Healthy Berkeley: It’s Up to Us! is excited to announce the start of NEW YEAR/NEW YOU! - a program that focuses on promoting movement and health. The kick-off is on October 13 at noon at the square in Martinsburg and will include a group walk around downtown Martinsburg. More information about the program, as well as registration forms, will be available at the kick-off. 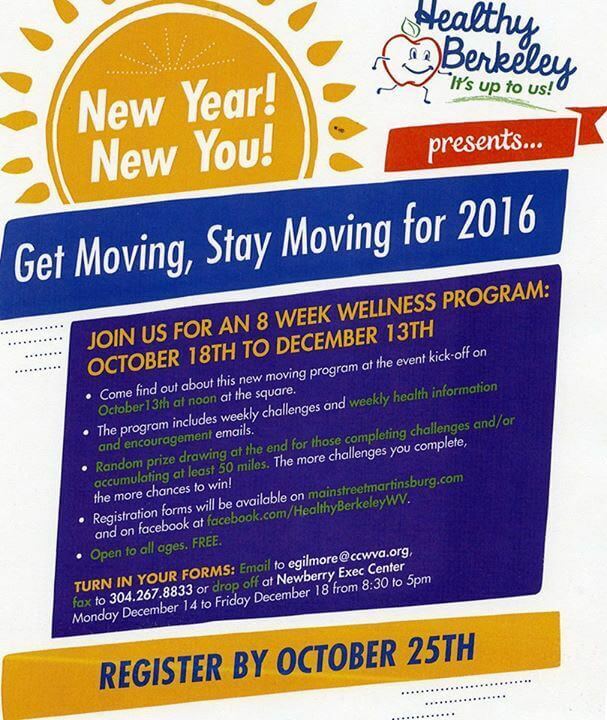 The program, open to individuals of any age, encourages people to move more and add healthy habits over the 8-week time period leading up to the new year. The program takes place October 18 to December 13. It is based on the honor system of people independently recording their movement activities each day. Walking, bicycling, hiking, running, or other activity such as raking leaves, dancing, playing soccer, etc. are all possible movement activities. Weekly informational emails will be sent to all registrants which will include weekly challenges to help introduce other wellness activities. Random prize drawings will occur at the end of the program. For each each challenge you complete, you get your name in for the drawing. Turning in your log sheet at the end will also get your name in the drawing…a total of 9 chances to win! !